Blue Les Copains Spring/Summer 2016 features a distinct nod to boho seventies chic, illustrated with 15 classic sportswear looks in a variety of juxtaposed materials from poplin paired with suede, to deep-dyed denim and chiffon and perforated leather. 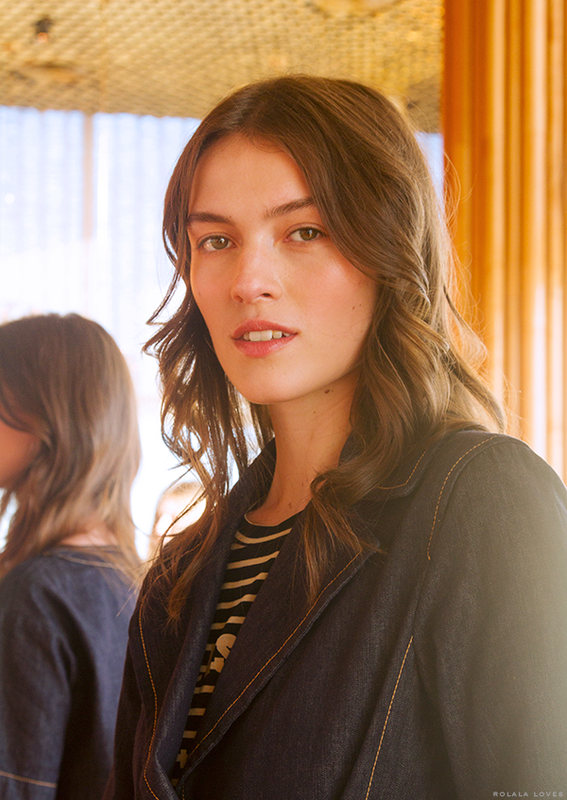 The collection starts with dark indigo accented by pops of red, blue and crisp whites. Bold geometric patterns and daisy prints reflect a retro inspiration, further accented by scattered suede fringe detailing, silk handkerchiefs and undone laced-up pieces. The collection transitions into graphic black and white pieces with hints of khaki, tempering the season’s pronounced color palette and brought to life by brocades and bold stripes. 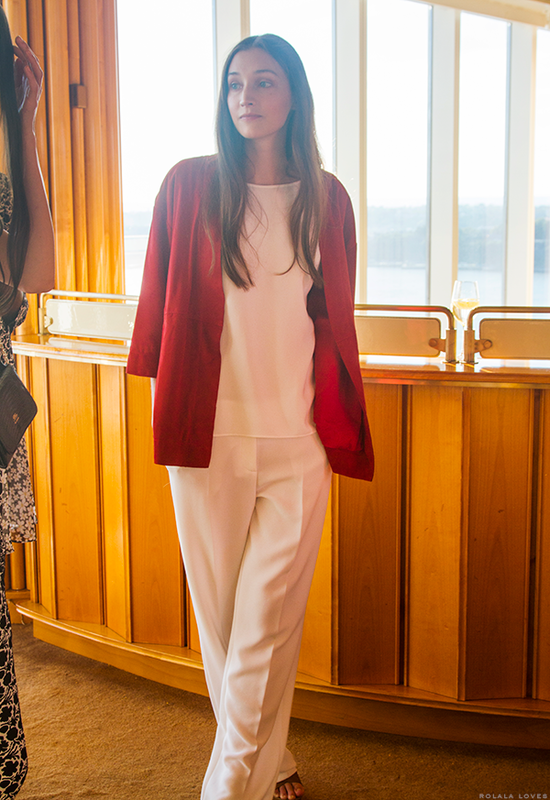 Structured jackets, expertly tailored wide-leg cropped pants, and fashionable handbags complete the Blue Les Copains offering with a modern affirmation toward non-conformity and effortless ease of wear. 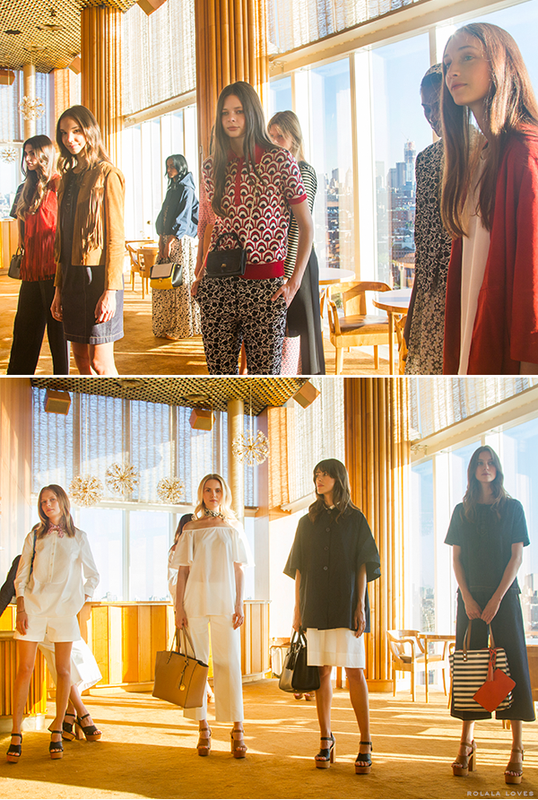 This NYFW presentation styled by Natalie Joos took place in the lavish penthouse lounge of the Boom Boom Room at the Top of the Standard. Guests including Julia Restoin Roitfeld and Hilary Swank sipped champagne and noshed on light bites while taking in the Italian luxury label's sophomore RTW collection against stunning views of Manhattan. Fresh and minimal hair and makeup by Paul Andrew and MAC Cosmetics respectively were an apt complement to these stylishly laid back looks. I tend to enjoy this type of fashion show format more than formal runway shows because you can really get a good look at the clothes and I definitely marveled at the wearability of these pieces as well as how easily they could be incorporated into one's existing wardrobe. 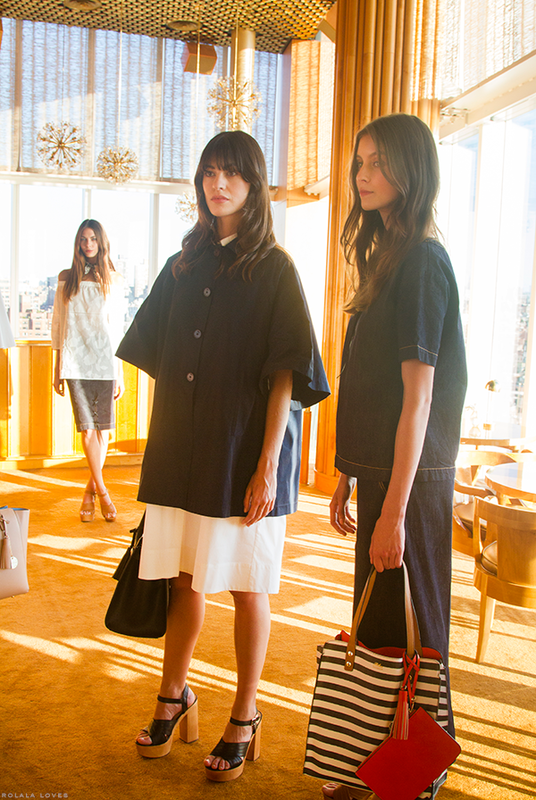 And I might be coveting a denim trench now. What do you think of this collection? Do any looks stand out to you? Stunning fashion doll great selection. There are a lot of wearable pieces in this collection, like that fringed jacket. Swoon! I love the patterns and the fringing. 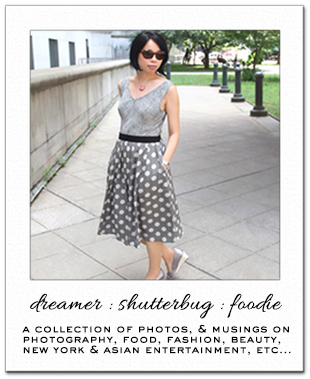 love this collection, and thanks rowena for sharing it with us! Finally a wearable collection! Most fashion shows make me scratch my head because they are not practical for day to day wardrobe so this is such a refreshing change! Wow, I love everyday single pièce of this collection!!! Great collection!!! I love it!!! So cool that you got to take part in this event. The collection is gorgeous and makes me look forward to next year! I simply love that this was shown in a penthouse. And some of these pieces are just stunning. I know I'd pair it with cool pieces in real life. I love it. Thanks for sharing Rowena. This collection is gorgeous! I love the mix of prints! Nice collection! What an interesting place to present it. I like the style and how wearable it is. Hi Rowena, yes! There are several pieces that stand out. Really pretty collection! The collection is fabulous and thanks for sharing. looks maravilhoso amei, tenha uma semana abençoada. Wow, LOVE this, this aesthetic is so up my alley. I really love it. Just divine.Yes presentations are much easier to shoot and I love how you get to see the clothes up close. And great photos too. 3 times WOW, Rowena! First for the show - I prefer this type of shows than runaways too. It's way easier to see the details and to feel the atmosphere the designers wanted to create. Second wow for the collection itself. I do like it a lot! And third wow for the photos! They are great and I must say you should attend more fashion shows and to share the photos you take with us! Have a nice day ahead, Rowena! Loving all the footwear - platforms 4EVA! I agree! You really can get a good luck at the collection! More should do this. I am loving the denim pieces and bags. I love, love the off the shoulder looks and the denim trench is definitely fab! So jealous that you got to go! I've been noticing a lot of brands are doing presentations instead of shows now, I have to admit I like the idea of shows better, but presentations seem a lot better for actually seeing the clothes. My favorite is that red off the shoulder top with the suede pencil skirt. Gorgeous pieces. I love the white collection. 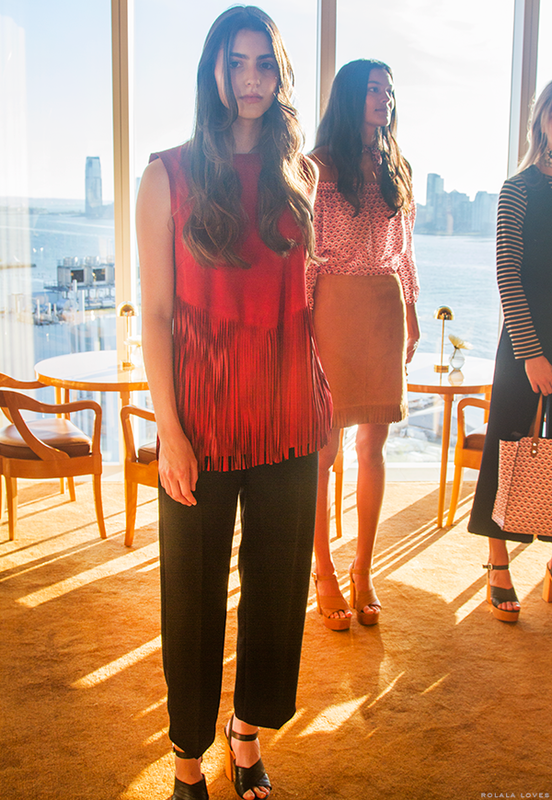 I love the patterns this season and the fringe (obviously)! !